Dear Father, How many Notre Dame female students will be influenced by your radical “Pro-Choice” position and end up killing their baby? Dear Father, How many babies will needlessly die because you exonerated and glorified a radical president who supports unrestricted baby killing? Is “Thou shall not kill.” no longer a commandment? Dear Father, How many students, who come to Notre Dame as practicing Catholics, tragically lose the Faith, because of poor Catholic leadership and teaching, similar to what you are now displaying? Dear Father, To save the integrity of Notre Dame and for the future well being of this university, you must now take responsibility for this scandal and immediately resign. This entry was posted on April 29, 2009 at 8:56 pm and is filed under 1. You can subscribe via RSS 2.0 feed to this post's comments. You can comment below, or link to this permanent URL from your own site. Great web site! 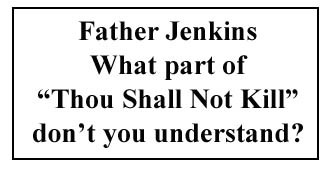 Father Jenkins must be reminded that being for “Choice” and “Reproductive Health” is not very pretty. Shame on Father Jenkins for ever allowing this scandalous event to occur at a Catholic university! What part of murder doesn’t Father understand?